Low Wood Bay HotelIn 2017 Low Wood Bay will become the Lake Districts first world class resort hotel. English Lakes Hotels Resorts & Venues, which has been run by the Berry family for more than 60 years, is confident about the future of the Lake District as a world class visitor destination, and is making a substantial investment to create a truly unique resort experience in the heart of this beautiful landscape. Be a part of this exciting next chapter of the story here at Low Wood Bay in 2017. All rooms in the existing hotel buildings will be undergoing a complete programme of upgrading and refurbishment. The new resort will also include a number of new rooms and suites, many with stunning lake views. The attention to detail and the quality of the accommodation at the new Low Wood Bay will ensure you enjoy your resting time in between all the experiences that the resort and the surrounding area offers the visitor. 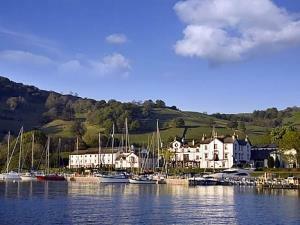 In 2017 Low Wood Bay will become the Lake Districts first world class resort hotel. By rail West Coast Main Line, London - Glasgow stopping at Oxenholme. Change trains for Windermere station. Taxis are available outside station or telephone Lakes Taxis freephone 0800 7317612. Leave M6 jct 36 onto A590 then A591 signposted to Kendal then Windermere. Hotel is situated 3 miles north of Windermere village. Couple of small suggestions/gripes in the room only. Hairdryer overheating too quickly & no facecloths in bathroom. Bed very comfortable, which mattresses do you use?